“Remaining heaven and hell for Davido to perform” – Bovi reacts to Davido performing in an unknown country. 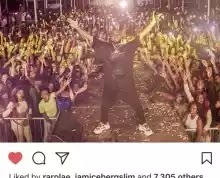 Nigerian Comedian Bovi has reacted after Davido made history by performing in a sold out concert in a ‘not so popular’ South American Country. One of Africa’s biggest music pop star and DMW‘s boss Davido made a history yesterday, as he sold out 10,000 capacity of a small region in the South American that most of us will never visit in our life. , which is not located in Africa, or Europe, or the USA, but Paramaribo, Suriname in the South America continent. This is an evidence that Nigeria music has gone global! Suriname is a small country on the northeastern coast of South America. It’s defined by vast swaths of tropical rainforest, Dutch colonial architecture, and a melting-pot culture. On its Atlantic coast is the capital, Paramaribo, where palm gardens grow near Fort Zeelandia, a 17th-century trading post. Paramaribo is also home to Saint Peter and Paul Basilica, a towering wood cathedral consecrated in 1885. This Gee just sold 10,000 tickets in a country i had never heard of until this moment. Suriname!! In South America of all places. Audience was singing word for word. Remaining heaven and hell for davido to perform!